A group of residents in Port Talbot say they are being driven crazy by the traffic calming measures introduced by their council. People living on the Sandfields Estate have started a campaign to remove the speed bumps put in place by Neath Port Talbot Council to enforce a 20mph speed limit. The campaigners say they support the speed restriction but cannot tolerate the added noise pollution they say the humps have created. 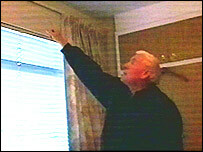 Some also claim that traffic driving over the bumps has caused structural damage to their homes. "The thumping noise over the speed humps is causing a lot of vibration in our homes and now its causing cracks to appear in our interior walls," says John Lewis, a resident of Sandfields for 42 years and one of the founders of the No Bumps campaign. "The vans and lorries have adopted the attitude that the faster they go over them the better, so they're doing speeds of 40mph here regularly". The latest set of the speed bumps were introduced to Sandfields earlier this year, in order to promote a safer environment for children and parents walking to school. One of the main arteries through the estate, Western Avenue, now has 23 bumps within a one mile stretch, as well as a raised zebra crossing. But according to Mr Lewis, they have done nothing to help the Sandfields community. "Children actually like to ride their bikes around and over the humps, its become like one of those skate parks here in the evenings," he said. Following complaints, Neath Port Talbot Borough Council carried out a three-month environmental study over the summer, to monitor the effect of the bumps on noise levels and car speeds. 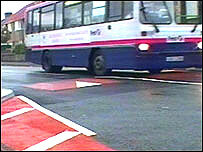 And director of technical services Will Watson insists the speed bumps are working. "If we look at our monitoring over the last three months, we can see a real reduction in the speed of traffic," he said. "There's also a slightly lower traffic noise level on the calmed roads than on 'uncalmed' roads but in terms of vibration there's no real difference. "The levels of vibration needed for structural damage to occur are 10 to 20 times higher than those we've recorded in the scientific work on the estate." You can find out more about this campaign and the issue of speed bumps at the BBC's new iCan website - an interactive service that allow you to get involved with your local community. Just by typing in your postcode you can find out what campaigns are going on in your area, as well as how to do things like change your GP or become a school governor. And if you want to try and change something where you live, iCan can help you set up your own campaign and contact people who feel the same as you.